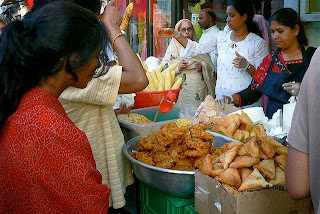 It's help yourself to street food in Toronto's Little India. My sons and I still laugh about the ‘water walla’ at the restaurant in the Little India district of Toronto, Ontario. We went there for dinner once upon the mid-1990s, tempted by the early bird special buffet deal on a winter Sunday evening. The water walla was poised with a large pitcher less than a discreet distance from our table in the otherwise empty dining-room. Each time one of us drank some water, he pounced to replenish the glass. Our early-bird special dining experience became a cat-and-mouse game of trying to cause a distraction and surreptitiously take a sip without alerting the hired help. By the end of the meal, we were kinked up with laughter. Yet we never went back to dine there again. I am reminded of the water walla every time I go online nowadays. And while it is touching to know that Google, Facebook and all the other conglomerates of the ether-world are anxious to replenish my glass – while emptying my wallet, no doubt – it has become another cat-and-mouse game and this one never seems to end. So time after time, I am proffered pictures of ‘attractive women 40+’ to tempt me into a dating website; the latest models of hiking boots to help my getaway fantasies; alluring travel deals for ‘silver surfers’; and so much more. Frankly it is getting a little embarrassing to think that a great host of online wallas is waiting to pounce on my every perceived desire and replenish my glass. Yet I can’t seem to get up from the table, settle my bill and leave. And each time I make a choice to do something that is seemingly innocuous, another little detail of my life goes winging its way to the wallas. The ones on Facebook are the most persistent. They now want to know where I was born, where I live now, where I went to school and every other possible detail they can winnow from the chaff of my life. Yet after several years of active Facebooking, I should think it obvious that, since I have chosen not to ‘complete my profile’, I might want to maintain some degree of discretion on the private details of my life. I must have got lost at that point. So if I want to take a surreptitious sip, then that is my business, not theirs. Yet how in heck do they know so much already? Not that I have ever taken a sip from the proffered, but so obviously bogus, dating websites offering 'scores of attractive' middle-aged women near where I live (on the faraway Frontier, of course), I am still curious to know how they computed my age range. At least it saves me the embarrassment of explaining to my partner why the online Googles are offering me ‘attractive women’ of inappropriate vintage. And I suppose hiking boots are also less suspicious than other forms of apparel. I ponder this while the wallas wait, thinking that like everything else nowadays, it probably has to do with Logarithms. Now I wish I had paid more attention in Maths class!